To shoulder about $840 million in added costs through 2021, district officials say they’re largely relying on more state funding and a 2020 California tax referendum — neither of which are guaranteed. District board members could also float a parcel tax, though it’s been unpopular in the past. Short-term fixes so far include cuts to the central office and the reassignment of some funds within the budget, a spokeswoman said by email. The contract compounds L.A. Unified’s financial woes, which include $15.2 billion in unfunded liabilities for post-employment benefits such as health care, about $500 million in annual deficit spending and millions in funding losses due to declining student enrollment. The new deal, in fact, could drive up this year’s deficit by about $187 million, according to a recent district projection. The agreement tripled L.A. Unified’s previous offer — from $130 million to $403 million over three years — to lower class sizes and hire more support staff, such as nurses. While L.A. Unified did end the last school year with nearly $2 billion in reserves, officials say most of it has already been earmarked for 6 percent raises, mandated programs and filling budget shortfalls as the district continues to spend more than it takes in. District officials are banking on new funding at both the state and local levels to afford the contract. But the bulk of those funding ideas are either not yet guaranteed, far from fruition or likely to face opposition. “The biggest issue is that [the contract] is based on two things: one, assumptions from the governor’s budget, and two, assumptions about future revenue,” said Alex Johnson, who sits on the county Board of Education. Those “are the two most critical things about this proposal that are concerning.” California watchers, including former Gov. Jerry Brown, are predicting a state recession after a period of soaring tax revenue growth. 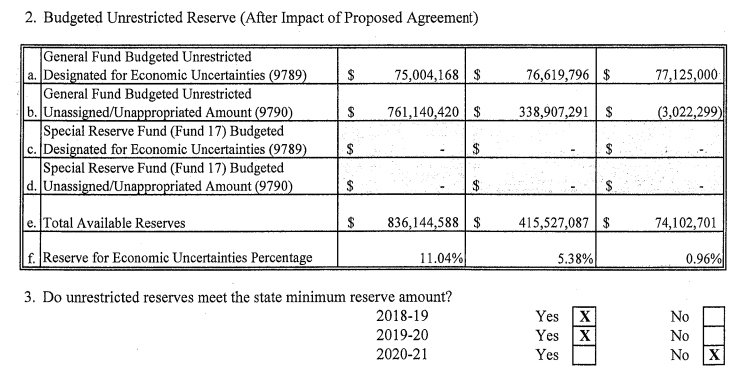 Some education observers note, though, that revenues from that tax reform would flow in too late, because the district is already expected to drain its reserves by 2021. A coalition of business groups has also denounced the measure and is pledging up to $100 million to defeat it. The district is also scrutinizing its current spending obligations. 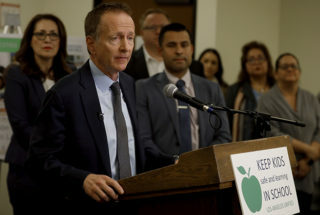 L.A. Unified — which is locked into a separate health benefits contract for three years— proposed during the contract negotiations a two-year delay to when new teachers would start receiving the district’s generous lifetime health benefits. The district spends $1.1 billion a year — about 15 percent of its budget — on health and welfare benefits. These benefits, along with pensions, are expected to consume half of L.A. Unified’s budget by 2031-32. L.A. Unified last year announced a 15 percent reduction of central office resources that will save $86 million over two years. Beutner last fall was also reportedly exploring a potential restructuring of the district into about 32 autonomous networks to further shrink the central office. That is an “ongoing” discussion and is not finalized, a district spokeswoman confirmed by email. The financial uncertainty has Sylvia Torres-Guillen, ACLU of California’s director of education equity, worried that the district will misallocate current funds — notably from the Local Control Funding Formula, the state’s funding mechanism that targets aid to low-income, foster and English language learner students — in a scramble to pay for the contract. ACLU successfully sued the district in 2015 on the grounds that it misused about $450 million in local control state funding, she said. While Duardo didn’t go so far as to recommend that board members reject the contract, Johnson, from the county board of education, noted that’s not her job. The union is skeptical of L.A. Unified’s financial projections. And there’s a reason for that: L.A. Unified did end last school year with nearly $2 billion in reserves, though district officials have stressed that most of that money was already earmarked. The district has also overstated its proverbial “fiscal cliff” in the past. It projected in 2016, for example, that it would be $400 million in the red by 2018-19. It isn’t.